His Holiness Saint Paul of Clontarf just emailed me this article where some bigshot African AIDS dude says that not only have Bono and Bob Geldof not helped Africa, in fact they’ve made things worse there. Next thing I know I’ve got Mr. Hewson himself on the phone screaming obscenities. I’m like, Dude, it’s an article from the NME. That’s a music magazine right? Who cares what they say? It’s like getting a bad review from CNET. I mean it’s not exactly the New York Times is it. 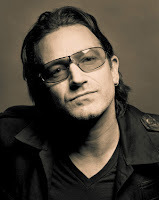 » Bono’s manager says Bono does all the work and I get all the money. Frankly I don’t have a problem with that arrangement.